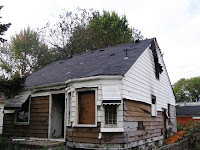 I have given a lot of thought to situations like this as well as the other problems that plague the City of Detroit, and Warrendale in particular. Just it's shear size makes managing the City of Detroit a constant challenge. It seems to me that a community like Warrendale, may be better served if it were no longer a part of the city. Certainly a city or township of Warrendale would be better served, not to mention the tax dollars of the residents used more effectively. The area of Warrendale still has a solid tax base despite the foreclosures and blight in the neighborhoods. It is obvious that the taxes paid out are not received back in the services that the residents deserve and paid for. Whether it's the tearing down of dangerous homes, streetlight repair, police and fire services, I believe that the residents of Warrendale can do a far better job of managing the affairs of Warrendale than the City of Detroit, regardless of who the mayor is. No one has more concern for Warrendale than those who live there. The City of Detroit is and has been dying, and we have been promised over and over again of it's rebirth or "Renaissance". My fear is that the city will continue to drag promising communities like Warrendale, my birthplace, down with it. Besides, Warrendale Township has a nice ring to it.